Cruz identified a six-point plan, his top priorities that will help to insure the school’s success in the coming years. “First we will work to clarify our vision and we will seek to solidify our identity as the nation’s ultimate urban serving institution,” he said. “Redoubling efforts to increase graduation rates, narrow achievement gaps” and reducing the amount of time it takes students to graduate. 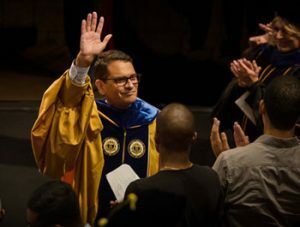 Cruz was greeted with several standing ovations during his introduction and he connected to the audience immediately with a personal anecdote from his childhood that demonstrated the importance of how a caring and supportive educator can change the course of a life. He recalled the fear he felt as a first grader going to school in Central Florida because he did not understand or speak English. Two weeks into the fall term he remembers returning home and tearfully telling his mother that he would never go to school again. “To this day, I am of the mind that my teacher’s sharp focus and open heart, helped shape the trajectory of my life,” he said. Cruz emphasized that he wasn’t naïve about the tough road ahead and thanked the community for the often blunt and candid 62-pages of comments that were submitted through an online survey. The comments gave the president a snapshot of what faculty, students, staff, and alumni most admire about Lehman College and what needs to be improved. The new president closed his address reminding the audience that the role of the College is to transform the lives of students who have not been given equal opportunities to achieve their goals. “We will inspire others to take intentional action to better serve the millions of students who are coming of age in America today, but who because of the color of their skin, the balance of their checking account, their place of origin, or the tenets of their faith—to date, have not been afforded the opportunities they need to meet their full potential,” he said.